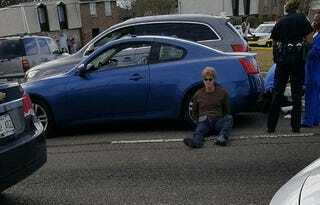 Ronald Gasser, the man authorities say shot and killed former NFL player Joe McKnight outside New Orleans, was released from custody overnight without being charged, according to the Jefferson Parish Sheriff's Office, NOLA.com reports. McKnight was shot and killed Thursday at the intersection of Behrman Highway and Holmes Boulevard in the New Orleans suburb of Terrytown, La. An eyewitness says she saw a man whom authorities have identified as Gasser yelling at McKnight while the former football player was apologizing for something. The man shot McKnight several times as he yelled, "I told you don't you [f—k] with me." Police say that when they arrived on the scene, the man, Gasser, 54, was there and handed officers his gun. McKnight had not been armed, authorities say. The Jefferson Parish Sheriff's Office says there are elements of the story that need to be investigated before Gasser can be charged. The investigators say the case is open and that a grand jury or district attorney will decide the charges.